Here are the topics planned for Poster Sessions 2017! As a not only a bellydancer, but also as a professional bellydance photographer, Carrie Meyer of The Dancers Eye often hears, “I always hate how I look in my performance photos!” Come by to talk about some simple tips and tricks that you as a dancer to give your audience your best performance face, but ways you can help your photographer (or videographer) get the best opportunity to capture you on stage! Carrie Meyer, Photographer/The Dancers Eye, has had an interest in cameras and photography from a very young age, when her parents first allowed her to experiment with several of their cameras. Having married her love of bellydance with her love of photography, Carrie offers dancer subjects a unique collaborative opportunity to work with an artist who truly understands the dance, and how dancers want themselves to be portrayed. Carrie’s work has been featured in Shimmy, Fuse, Jareeda, Zagareet, and Yallah, among other publications. 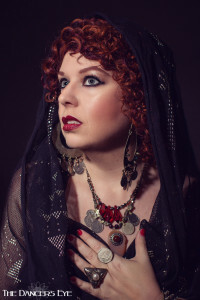 Carrie is also a Staff Photographer for Fuse Bellydance Magazine. Tribal Costuming 101: The Basics goes over what a dancer needs to create the basic costume any ATS® or ITS tribal dancer needs to perform. In this workshop, I will go over the foundation pieces, the adornments, and those finishing touches that each dancer will need to create a complete costume while also finding their own unique style within those basics. We will go over costume vs. Costume-ish, considering your audience/venue/music/story, what pieces to invest in, color/movement/texture within the costume, and of course it wouldn’t be a Becka Bomb workshop if we didn’t talk about Glitter. Becka Bomb is best known for her absolute love of everything Glitter. She has a strong background in American Tribal Style®, Improvisational Tribal Style and Skirt. She has studied under Ava Fleming, K-Lee of Natium World Dance, Shannon Conklin of Divine Chaos Tribal and continues her ATS® studies with Kamalah Tribal’s directors, Lenay and Jorden. 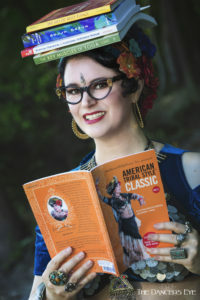 She believes in continuing dance education taking workshops with members of FatChanceBellyDance®, FCBD® Sister Studio® teachers, and WildCard BellyDance just to name a few. Becka Bomb loves to incorporate props into her dance and is proficient in sword, veil and skirt. She also emcees at local events, teaches makeup/costuming workshops and is the owner of Beckabomb’s Buds. Inspired by the uplifted body posture of Flamenco and the precise hip work of Middle Eastern dance, ATS® is a blend of cultural dance influences. Drawing on these foundational art forms for creative inspiration, Scarlet Thistle has developed Movement Dialect that incorporate Flamenco stylizations, classic foot patterns, and exciting hip work which look stunning in a group. This workshop presents fast and slow Intermediate to Advanced level movements, including flourishes and variations, that are ATS® and group improv friendly. Bring zils. Colette Todorov began belly dancing in 1997 with Carolena Nericcio-Bohlman of FatChanceBellyDance® (FCBD) and was immediately intrigued by the many facets of American Tribal Style® (ATS®). She was a member of the professional troupe for over six years and a teacher at the FCBD studio, appearing in instructional and performance videos during that time. Colette relocated to Oregon in 2008, establishing Scarlet Thistle Studio and founding her performance troupe. 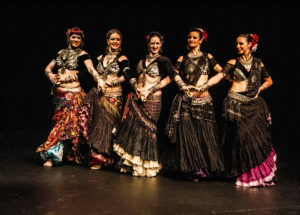 She is the resident ATS® instructor at Datura, Rachel Brice’s studio in Portland, and DaturaOnline, bringing over a decade of belly dance teaching experience to students all over the world. Her goal is to continue to develop as a dancer and to inspire others to discover how dance and creativity can drastically enhance their life. Utilizing existing ATS® movements and tribal concepts, this combines the beauty of two props—the fan and skirt—to get in touch with the Flamenco roots. Bore out of a solo idea several years ago for a TribalFest performance, Super Beth had been working with the fan when inspiration struck to incorporate the skirt with it. With a keen understanding the ATS® aesthetic and movement, and after several years of working out the bugs and teaching it to her troupe Tamarind, Super Beth has outlined a program for incorporating these props into your set. Topics included in the program including, skirt tucking, picks ups, and holding the skirt in a graceful manner; using the skirt to frame and enhance movements; and holding, opening, and moving the fan in space; specific movements which make use of this concept; and group concept work with these props. 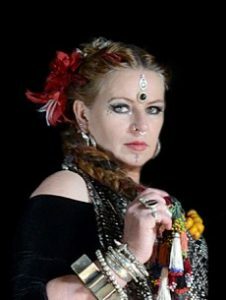 Elizabeth Fish, affectionately referred to as “Super Beth,” is the Director of Tamarind Tribal Bellydance. Super Beth is a certified FCBD® ATS® instructor and Sister Studio who has been studying ATS since late 2006. Super Beth has taught such events as the ATS® Homecoming, 3rd Coast Tribal, and performs and teaches throughout the globe, in addition to teaching regular classes at UW Milwaukee. By design, American Tribal Style® offers an advantage through all its options. Classic, Modern, Movement Dialect, turbans, flowers, floorwork, props or no props – the choices and combinations are endless. Workshops offer additional inspiration, leaving us with even more choices! How do we get the most out of our workshop learning? How do we consistently build our own ATS® brand while we take in all the latest trends and discussions? Identifying one’s brand can aid in the decision making process around shows/gigs, class, workshop commitments, etc. I am proposing a business lecture/discussion session around ATS® brand building. We’ll participate in classic marketing exercises around branding – every participant will leave with seeds for their brand definition process. Key questions around audience, emotional messaging, and call-to-action will be discussed. 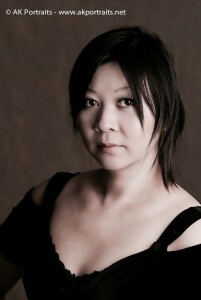 Paula Ngo was first introduced to ATS® in 2009. Belly dance was a fitness curiosity, and she enrolled in her first class with Sam Brenneman. Practicing across the dining room and in the kitchen, she realized all her interests had come together in this dance form. Two years later, she earned ATS® General Skills certification and joined Maria Dancer’s troupe, Shimmy By Fire. She completed ATS® Teacher Training in 2014 to become a FatChanceBellyDance® Sister Studio. Current dance efforts include studies with Tamarind Tribal, Latin dance, and other folkloric dance classes. As Amaranth’s troupe director, Paula is an avid collector of each troupe member’s dreams. Visit www.sepiatribal.com and www.tribeamaranth.com for more information. We have all benefited from Carolena’s extensive library, whether virtually or in person. The librarians of ATS® want to know what’s in your library? Stop by to view shelfies and read librarian recommendations, and please bring your own recommendations to place upon our virtual shelves. Post-Homecoming, we will be integrating your favorites into an annotated bibliography to share with the ATS® community. Diana Saylor dances and teaches ATS® as Elm City Shimmy, in New Haven, CT. She is a professional law librarian and avid book collector. Stop by our booth to learn about other ATS®-dancing librarians! Finding yourself as part of an ATS® troupe or as a solo artist without a studio can make marketing and mentorship problematic. Facing just this scenario in 2013, the dancers of Twisted Dance Studio were facing the logistical problem of how to nurture upcoming dancers as well as how to market themselves without having a studio to call home. We will discuss the process of forming a collective…some of our challenges and many of our successes! We’ve had fun learning and growing together, and have great plans for the future—to grow our ATS community and the greater Middle Eastern Dance community as well. 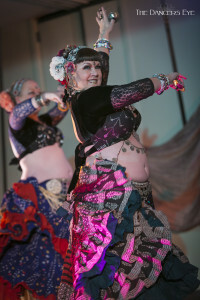 Sara Ann Howard began belly dancing in 2011 and it very quickly became an obsession. She was drawn to the positive and proud form of American Tribal Style, which speaks to Sara’s love of strong community, her passion for music and movement–not to mention the glorious pageantry of the costumes. All these elements are woven together celebrating the past, present and future of communal dance. In 2013, Sara continued her ATS training by attending the FCBD American Tribal Style General Skills/Teacher Training with masters Carolena Nericcio-Bohlman and Mehga Gavin. There, she earned her TT Certification. Sara has Sister Studio status, meaning anywhere she teaches a “Sister is in the Studio” following the FCBD teaching format and guidelines. She is currently enrolled in the Sister Studio Continuing Education certification, and someday hopes to attend Teaching for the Teacher and Advanced Teacher Training to further increase her teaching skills. When the studio where Sara studied—Twisted Dance Studio—was forced to close in 2014, she and the other teachers and advanced students decided to form the Twisted Dance Collective. The Collective is a group of like minded dancers who have banded together to increase the amount of impact in their community. By sharing resources and a common name, they are able to continue to teach, dance and produce local shows to raise funds for local charities. Thanks for a very generous donation from Krishna Dave, ATS® Homecoming is able to offer a Healing Room for the first time this year. Meet Jena Vincent, massage therapist and Amanda Olson, henna artist who will be serving as the anchors for the Healing Room. Members of the Healing Room planning committee will also be available to help you register for an appointment throughout the weekend and explain the various healing modalities available to you during the conference. By the time of Homecoming 2017 our Sister to Sister sewing workshop will have been up and running for a whole year and we’ll have more than 350 women using a contraceptive implant. All of this was made possible by our dance community. Come and find out how everyone is getting on. Based in the South West of England, Kelley Beeston regularly crosses the pond to visit the ‘mothership’ and travels worldwide not only to train with master ATS® teachers but also for her humanitarian work. In 2010 she became a Sister Studio and then a Sister Studio Continuing Education (SSCE) Instructor, graduating from the first Advanced Teacher Training in June 2015. Kelley is currently working with Carolena Nericcio-Bohlman on their Sister to Sister projects to empower women in the Kivu region of the Democratic Republic of Congo. While it will take time for each of us to find our sweet spot there are a few tips to finding it. 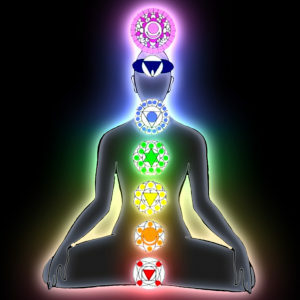 Becoming aware of your range within your kinesphere is one of them. It’s not about how to look like your teacher or a dancer you admire but about how to make the move look effortless and graceful on you. If you think of yourself as a “vitruvian woman” with a circle around you and a plumb line running down the center of your body and your arms moving out in diagonal lines within that circle to create a pathway that is organic to your body it helps you to create beautiful shapes, which in turn leads to a relaxed and confident stage presence. Awareness of your biomechanics help enhance the overall aesthetic of your trace-forms (the spatial consequences of our movements). When moving slowly through space it is easier to spot awkward movement or movement lacking confidence. I associate the slow vocabulary with 2 words beauty and strength, two things I feel are easily attained by presenting authentic and graceful movement. Learning about the kinesphere and using it to its full potential produces clean, strong, and beautiful movement on each individual dancer’s frame. Heidi Hernandez fell in love with movement very early in life. Originally ballet classes captured her attention but she quickly discovered that one style of dance wasn’t enough and continued exploring different genres into her college years. 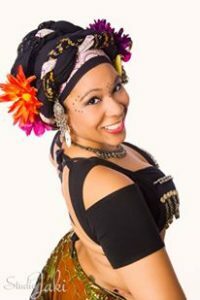 Upon graduation she discovered belly dancing and after about a year was able to start taking ATS with Jaki Hawthorne of the Jahara Phoenix Dance Company (now Tarabiya Dance and Music). 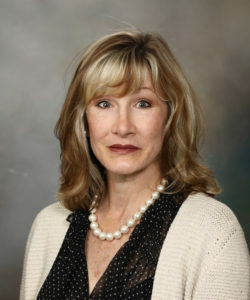 As a student in Sherar and a member of JP Heidi has performed ATS throughout the Southeast since 2009. Receiving her GS in 2012, and taking workshops and class with Carolena, Megha, DeAnna, and Helm along the way. She looks forward to receiving her TT certification in the very near future and empowering young ladies in her area through a SEEDs program and sharing her love ATS. “I taken lots of dance before, but this feels different. What is this? Will I fit in?” As a student, I’ve had some… or ALL of the emotions above. We walk in to our first class, and may have no idea what to expect. We are all students. I am forever a student. As a teacher, I want to help each student feel welcomed, comfortable, and wanted. I can inspire each dancer in class, but I can do more, provide information. I am forever a student. Alexandra Wolf is a FCBD® Sister Studio/SSCE teaching ATS® and director to Mayari Dance Collective, a multi-level student troupe, and performing troupe Muse. They love to perform, including a yearly professional show with Amira Dance Productions selling out the Orpheum Theatre in Wichita, Kansas. Alexandra uses her project management and customer relationship skills from a large manufacturing firm to also start her business Calypso. Originally from California, she started early with ballet, jazz, theatre and music. In college, her previous Olympic Games Coach Yeager, inspired her to win the Texas Collegiate Gymnastics Championship. While at the University of Texas , she also became a nationally rated USGA judge. She realized teaching and coaching in earnest, as she taught dance and gymnastics to all ages. Her dance style and choreography has appeared from the stages of Houston to national-level gymnasts, and varied dance troupes in the midwest. Alexandra feels fortunate to have had many inspiring teachers to develop her loves of dancing, teaching, image art, and especially forever being a student. Brave, bold, confident, strong – powerful words synonymous with ATS®. Need to shake off nerves, quiet your inner critic, or awaken your super power? Well you can. In less than two minutes you can change your mind-body connection from inhibited to empowered.This poster session will cover a variety of power poses, postures and gestures to use anytime, anyplace you feel you need to elevate your confidence and tap into your power source. Come on, you got this! 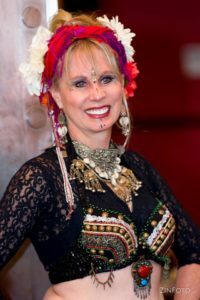 Kathy Stahlman is a FatChanceBellyDance® Sister Studio, certified ATS® instructor, director of Tribal Moon Belly Dance, and former member of FCBD®. This project is about aging and dancing and how to negotiate these waters. When we share our stories about how we have grown into the unique individuals we have become and how we are adjusting our dance to suit us physically, psychologically, emotionally, and socially at this stage of life we grow from our own words and from the words of others. We bring to light a pro-active path to aging and dance so that we do not live by stereotypes, or bad knees, or concern about changes in our physical appearance. But instead, through communal wisdom, we redefine these life changes as something to embrace with personal empowerment and dance. Please stop by the booth and see how you can help re-define ‘aging’ and return it to a place of dignity and beauty and positive expectations. 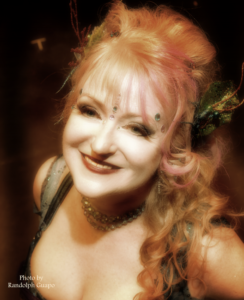 Janine Turner is a FCBD® sister studio, ATS® troupe director, and performer. 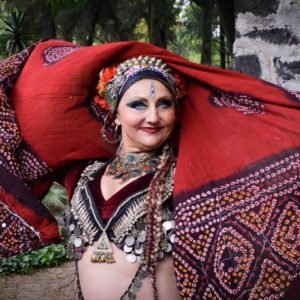 She lives in Richmond, VA where she directs Ajna Tribal, a troupe of creative dancers dedicated to raising community awareness of ATS® and the accessibility of this dance to all. This year she took on the project of guiding ten ATS® dancers from various parts of the country, who will come together for the first time at Homecoming 2017, and present an improvisational ATS® performance using double swords. Janine uses her skills and knowledge from her previous career as psychotherapist to create books showcasing personal empowerment and the unique beauty in us all. Her first book “The ATS® Community Coloring Book” is making its debut at Homecoming 2017. She is currently in the process of developing her second book “I Will Dance ‘till a Hundred and One” which addresses aging and dance in a pro-active manner to stimulate positive dialogue and re-definition of a long overlooked subject. 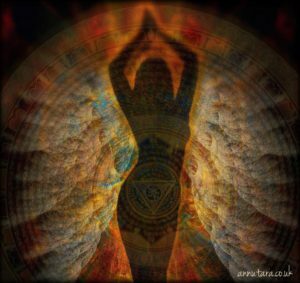 Sacred dance can take many forms – ritual dance for celebration or healing, utilizing spiritual elements in our dance, dancing with Divine presence, sharing a mystical experience with other dancers, with an audience, with Deity or many Deities, and many other forms. Gaia Sophia and KareIsis believe ATS can be used in a sacred way to enhance our spiritual practices and we would like to share that with you. We have also reached out to the community to ask others to share with us the way that they feel ATS is a sacred dance practice and we will be presenting the results of that outreach is various formats. Musculoskeletal injuries occur frequently among dancers, particularly with increasing age. Common problems include plantar fasciitis, rotator cuff tendinitis, as well as low back and knee pain. Strategic stretching and strengthening activities can effectively prevent or mitigate many injuries. Subtle technical adaptations may also help. This poster will outline common musculoskeletal issues and recommend simple, yet comprehensive, preventive, and management approaches. Andrea Cheville is a Professor and Research Chair of Physical Medicine and Rehabilitation at the Mayo Clinic Rochester, MN. She has been studying ATS belly dance for 2.5 years, after dancing classical ballet for over 30 years. She specializes in cancer rehabilitation and palliative care which involves managing the musculoskeletal issues of cancer survivors seeking to resume full and physically active lives. 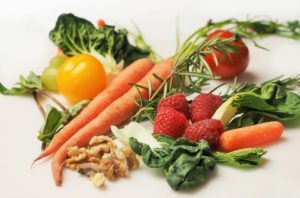 Are you curious about what a vegan lifestyle is? Are you wondering how it can positively impact your health or state of mind? What motivates someone to choose such a lifestyle? Drop by the Vegan Lifestyle booth at ATS® Homecoming to chat with Carolena and Megha about how and why they chose this path and get your questions answered. A lush bun at the back of a hair garden creates a stunning look for ATS® performance. But many of us don’t have the hair for a real bun. 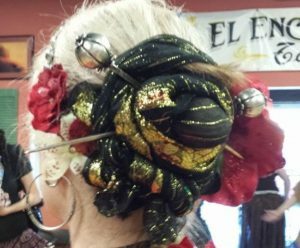 In this mini-workshop, Nancy Young will demonstrate her easy technique for creating a gorgeous scarf bun, studded with hairsticks and draped with tribal tassels. Nancy Young, from Claremont, CA, has been studying ATS® since 2005 and has been a FCBD® Sister Studio since 2009. 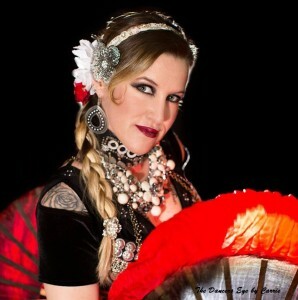 She teaches ATS® at Tribal Beats Studio in Upland, CA, and at her home studio, Sunroom Belly Dance, in Claremont. Nancy is director of Torso Dance Collective and of her student troupe, Womenfolk.